Short and sweet, this off-season Halloween treat will satisfy your horror craving and tickle your funny bone. In a fantastical display of necromancy, Doctor Zomba's Ghost Show of Terror successfully raises the dead - a dead art form, that is. Inspired by the midnight spook shows of yesteryear, the 40-minute theatrical presentation combines magic, mesmerism, and monsters into an ectoplasmic cocktail that is part recreation and part spoof of its sources, culminating in an immersive blackout experience that fills the small venue with a lively collection of luminescent spirits. Audience members need not be familiar with the spook show phenomenon in order to enjoy Doctor Zomba's Ghost Show of Terror, but knowledge certainly adds a nostalgic layer to the entertainment. Midnight Spook Shows (also known as Midnight Ghost Shows or Midnight Monster Shows) were an outgrowth of the spiritualist movement popular in the early quarter of the 20th century. After the practice of contacting loved ones from the beyond was debunked by the likes of Harry Houdini, conducting seances around a table in a domestic setting dwindled in popularity; however, magicians kept illusions alive by transferring them back to the stage (where many spiritualists' tricks had originated). Though still billed as authentic supernatural phenomena, these shows were more obviously intended for entertainment purposes: people were no longer hoping to converse with dead relatives; they were paying to see a scary stage show. Spook Shows tended to play in venues after the regular productions had closed for the night - hence, the name "Midnight Spook Shows." Soon, they were playing before late-night screenings of horror movies such as The Vampire Bat (1933) and Dead Men Walk (1943), prefiguring the midnight movie screenings that became popular in the 1960s. Shows typically began with traditional stage magic, including hypnotizing volunteers from the audience, while the magician-host gradually whetted audience anticipation for the spectacular spectral manifestations at the climax (typically achieved with glow-in-the-dark black light effects). Gradually, the shows became more deliberately comic, dropping the pretense of actually summoning spirits, and turned into horror-themed reviews, with costumed monsters (Frankenstein, the Mummy) running loose and attacking the customers - all for a good laugh. Midnight Spook Shows finally gave up the ghost in the late 1970s, but their traditions survive in the form of horror movie TV hosts and immersive theatrical experiences. In the tradition of the later spook shows (e.g., Silkini’s Asylum of Horrors), Doctor Zomba's Ghost Show of Terror aims largely for laughs. Following the spook show template, Dr Zomba (David M Beach) begins with some familiar routines (legerdemain , ventriloquism) while warning the audience of the horrors to come. The initial joke is that his fakery is so obvious that the magic barely qualifies as "tricks;" then just when the joke has been milked to death, Dr Zomba pulls off a really good illusion or two. Later, a blind-folded volunteer gets to touch a real dead body - literally true, though not in quite the way the build-up would suggest. Even Count Dracula makes a cameo appearance, for good measure. Along the way, Zomba's talking dummy lets slip a few hints that force the doctor to admit he stole his ghost show from a rival, whom he hypnotized into committing a murder - stealing the rival's beautiful daughter for good measure! This sets up a dramatic confrontation that turns the half-hour show into a mini-play instead of a mere collection of spooky vignettes, leading to a gruesomely Grand Guignol moment of vengeance before wrapping up with traditional blackout, during which a swarm of spirits float in the air, creep into the audience, and even bounce on a few laps. Doctor Zomba's Ghost Show of Terror uses its brief running time to the fullest, moving along at a spritely clip and reaching a satisfying conclusion long before any chance of wearing out its welcome (the show lives up to the old vaudeville advice, "Leave the audience wanting more"). For all the laughs, the show delivers the goods with some simple but effective illusions for the climactic ghosts. Only the demise of the villain falls short, offering not quite as much splatter as the build-up suggests. David Beach effectively commands audience attention as the titular doctor, and Kerr Lordygan offers able assistance as Zomba's deformed assistant, Ear-Gore. The weak link is the somnabulistic Sirena, who as the plot's requisite damsel in distress gets little to do except stare vacantly and perform the "Dance of the Damned;" at least Tamara Torres's movements manage to distinguish the character's transition from being mesmerized by Zomba to only pretending to be mesmerized in order to fool Zomba. Since few of us today are old enough to have experienced the golden era of Midnight Spook Shows, Doctor Zomba's Ghost Show of Terror is a welcome opportunity to finally visit that lost netherworld of supernatural shenanigans. Fortunately, the play's appeal extends beyond nostalgia, offering a humorous, immersive theatrical experience that feels completely contemporary, thanks to witty writing, clever staging, and adept performances. See it - but only if your heart can stand the onslaught of mayhem, magic, and monsters from beyond the grave! Dr Zomba’s Ghost Show of Terror is all right! No, we are not damning with faint praise – just riffing on one of the show’s many jokes (at the expense of ventriloquist’s dummy who loses his left arm and left leg). The short spoof of old-fashioned midnight spook shows poses as a magic act featuring mesmerism and spiritualism, but it’s really a mini-play with some dramatic twists and lots of laughs. It’s like a little spooky summertime treat – recommended for addicts who can’t wait till October for Halloween. Cast & Credits: Written by David Lucarelli. Directed by Kevin Wetmore. David M Beach as Doctor Zomba. Kerr Lordygan as Ear-Gore. Tamara Torres as Sirena. S. Alessandro Martinez as Dracula. 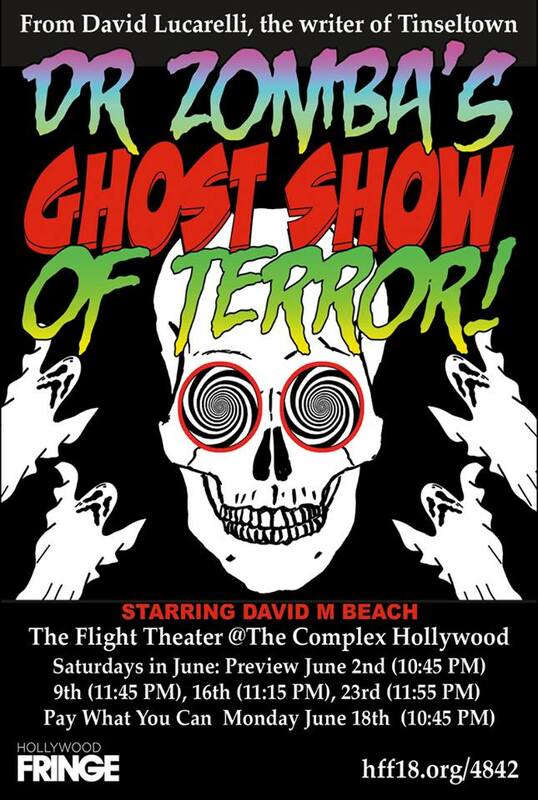 UPDATE: Since this review originally posted, Doctor Zomba’s Ghost Show of Terror has returned to the Flight Theatre at the Complex Hollywood for performances on October 20, 26-27, and November 3. The address is 6476 Santa Monica Boulevard, Los Angeles, CA 90038. Get more info here.